1. One audience consists of experienced one-to-one coaches, who want to extend their portfolio into the more complex area of team coaching. 2. The second audience is people, already working in the area of team coaching, who wish to test their knowledge and practice against an emerging body of evidence-based good practice. 3. The third intended audience is Human Resource professionals, who wish to gain a deeper understanding of team coaching so that they can be more effective in determining when and where to use it in their organisations, in selecting and managing externally resourced team coaches, and, if appropriate, building an internal team coaching resource. 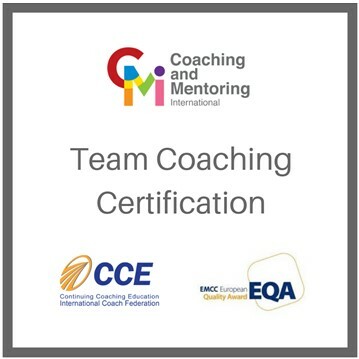 Quality Award Accreditation at the Practitioner Level: Begin the learning journey towards becoming an accredited team coach at Foundation or Practitioner level. Please ask us about the EMCC Accreditation pathway. Date: This is a 3-day training course, which runs 9:00AM-6:00PM from June 11-13, 2019.